This story has stuck in my mind because it perfectly describes the problem we have today with people who head Christian organizations. They often think so highly of themselves that they feel the laws of nature should obey their command. After hearing his story, I could only wonder if Mr. Roberts had expected the old man to magically produce Mike out of thin air. I’ve been active in end-time ministry for over 25 years, and I’ve seen all kinds of examples of gross arrogance and incompliance of so-called church leaders. It saddens me to say that there is only a hand full of elders that I respect. 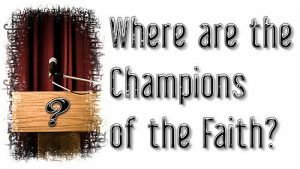 The question for today is what has happen to all the champions of the faith? In recent years, the spectacular growth of communication technology has made personality cults a pandemic problem for our day. In the 90s, video cameras were rented by the hour to make recording that would be distributed via VHS tapes. Today, cameras are so cheap; they’re a component of many of our gadgets. You can now record a video, and have it instantly uploaded to your YouTube page. The explosion of media has fostered a cult of personality in the Church. Pastors and leaders with any type of exceptional gifts have been cast into the limelight. Success is measured by how many hits you have or by your number of Facebook friends. To be a key player in the Christian world, you need to have a large television ministry. It costs very little to have a web site or video portal, so anyone can be a star. I know of several preachers who have almost zero followers, and yet they act like they have millions of fans. You can tell this from how they assume their listens would be interested in the most trivial details of their lives. Our Christian culture has a glut of pastors and leaders that have become idols. Just like with their counterparts in Hollywood , Christian celebrities fly around in private jets, and rely on a fan base to market themselves. Anyone with a basic understand of the Bible should know that cults of personality are from the devil. God’s Word says that greatness comes from servitude. “But he who is greatest among you shall be your servant. And whoever exalts himself will be humbled, and he who humbles himself will be exalted. (Mt. 23:11-12). It’s not necessarily bad to have a ministry that is driven by the leader’s desire to achieve greatness. Because motivation is vital for success, it’s important for people to have the right kind of pride in what they do. Most people, however, lack the ability to keep their egos in check. Unless there is an independent body to keep a ministry leader grounded in truth, pride will cause even the best such leader to eventually stray from biblical principals. When a person becomes their own source of moral guidance, they can create a situation where they don’t see errors that are obvious to even the most casual observer. Pat Robertson, the head of Christian Broadcast Network, for example, recently illustrated how ego can cloud good judgment. He said that he considers that it’s okay to divorce a spouse that develops a condition that makes them mentally incapacitated. He offered that someone with Altzheimers was dead upstairs, so it was okay to ship one’s wife or husband off to a retirement home, while you head to the singles bar. Common sense would tell you that this is a stupid idea. The Bible clearly says that marriage is to last until physical death separates a married couple. I had some people ask me about Robertson’s statement. I bluntly said, “Pat Robertson needs to get checked himself to see if he has Alzheimer’s disease.” Robertson has made similar statements in the past, and what makes him a gaff factory is the culture that allows his views to stand as being equal to Bible Truth. Far too often, Christian organizations operate under the assumption that the head guy is always right. There is no accountability. In the corporate world, you have a board of directors to keep the CEO in line. In Christian camps, negative public opinion is often the only check and balance on a run away ego. Joel Osteen is regarded as the most successful preacher in America . His ministry reaches over seven million broadcast media viewers weekly in over 100 nations around the world. His Lakewood Church in Houston , Texas is the largest congregation in the United States , averaging more than 43,500 in attendance per week. Robert Morrison was a mirror reflection of Osteen. He was a Scottish pastor who became the first Christian Protestant missionary to China . The Roman Catholic Church viewed him as threat to their turf and tried repeatedly to have him deplored. We labored for 25 years, and by the time of his death, he had only managed to baptized ten Chinese believers. In the Kingdom of God , I am certain that Morrison is seen as the one who achieved greatness. Osteen has a large audience because he preaches a message that is designed to make people feel good about themselves. He admits that he does not want to talk about anything negative. Sin, hell, and God’s wrath are not part of his vocabulary. Several years ago, I attended a prophecy conference in Dallas , Texas . During our banquet session, a major Christian organization stopped by to give a commencement address and to pick up a donation check from the head of our organization. When the guy entered the room, he had a huge entourage. Two of them were the pilots to his private jet, which he openly bragged to us for no real reason. Until then, I didn’t know that Christian leaders had entourages. If they are going to speak somewhere, I thought all they need to bring with them is their Bible. Today, a big wig might travel with a person assistant, a publicity agent or his chauffeur. I was looking at an article about various Word of Faith leaders. In the story was the perfect photo example of the excess that has grown around people who preach prosperity. Here was the leader of a Missouri based ministries going from her $10 million corporate jet to her $107,000 Mercedes sedan. While she was making the transfer, an aid held a large white umbrella over her head to shield her from the weather. How can these people be affective salesman for the Kingdom of God when it is so obvious that they prefer the riches of this life? They do point to heavenly wealth, but only as part of cynical marketing plan. The true champions of the faith are ones that lack luxuries. John Wesley, the founder of the Methodist movement, lived a life of piety and humility. Wesley travelled by horseback, preaching as much as two or three times each day. He received at least £20,000 for his publications, which was a huge about of money for his day, but used little of it for himself. Hudson Taylor is another example true Champions that is unfamiliar to this generation. He was another missionary to China . Historian Ruth Tucker gave this summary of his life, “ No other missionary in the nineteen centuries since the Apostle Paul has had a wider vision and has carried out a more systematised plan of evangelising a broad geographical area than Hudson Taylor. When his China Inland Mission was attacked in the Boxer Rebellion with (58 missionaries, 21 children were killed), Taylor refused to accept payment for loss of property or life, to show the ‘meekness and gentleness of Christ’. I firmly believe that the big time, ego-driven, preachers of today–that is, those who make it to Glory–will all be living on poverty row in heaven. If this generation of Church leaders knew where they currently stand in God’s ranking, they might have a more humble attitude about their work. It is deeply regrettable that there are very few people of this generation that believers can truly look up to as men after God’s own Heart. Since we live in the Laodicean age of the Church, there seem to be little hope this side of the rapture of major spiritual awakening. I am encouraged, however, by the knowledge that after the rapture, the champions of the faith will quickly come on the scene in great abundance. The suffering of the tribulation hour will be the catalyst for a huge revival. Millions will be saved and God’s Kingdom enlarged as perhaps at no other time in human history.